myPath is an online tool that shows how your academic record at Douglas College fits into your program requirements in an easy-to-read list of courses you have completed, or still need to complete, for your program of study. With myPath, your program requirements are clearly laid out. This means you can choose your courses with confidence – and ensure your path to graduation is as quick and smooth as possible. 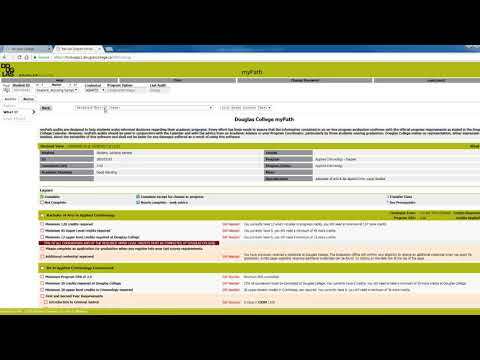 myPath is available to all Douglas College credit students. Why should I use myPath? Know what you need to graduate: myPath helps you plan what courses you need to complete your program. Change programs with confidence: use myPath’s “what if” feature to see which of your courses can be applied to another program at Douglas. Where can I find myPath? myPath lives in your myAccount. Sign in with the same username and password you use to sign into Blackboard or any College computer. As long as you have an Internet connection, you can access myPath. An audit is a review of past and current coursework that provides information on completed and outstanding requirements. It can be used as a tool to plan and track your progress toward earning your credential. Who can see my myPath account? myPath information is considered confidential student information, so only you, Douglas College Academic Advisors and program Chairs/Coordinators have access to myPath. Academic Advisors and program Chairs/Coordinators access myPath for academic advising purposes. 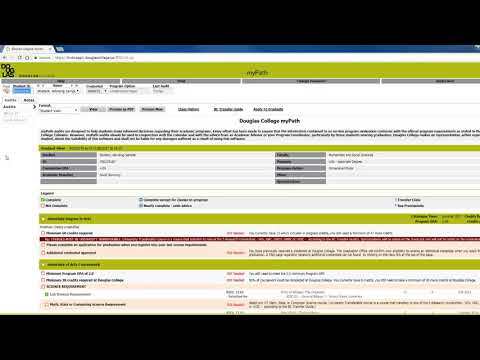 Can I register for courses in myPath? My program is wrong on my audit. The program that is showing in myPath is the program that you have been accepted into based on your program choice at the time of application. If you would like to change your program, contact the Registrar’s office for instructions. In the meanwhile, you can run a "what-if" report to see what is required in another program. Please watch the "what-if" video for more information. Can I change my program in myPath? No. Please speak to an Academic Advisor for information on changing your program. When will an update (grades, grade changes, etc.) display in myPath? Updates will display within 48 hours of the change/update being made. While we have tried to make sure that your audit is correct, it is difficult to predict every unique situation or problem. We want to work with you to correct any issues as soon as possible. The first step is to clarify what information you believe is wrong. Please email helpdesk at helpdesk@douglascollege.ca. Does myPath show courses I have completed but not passed? myPath displays completed courses that did not achieve a passing grade in the “Grade requirements not met” area of the audit. This area is below the main body of the audit. Will myPath show the courses I've completed at another post-secondary institution? Courses taken at another institution will only show if you have applied for transfer credit. The course will be marked with a “!” next to it, on the Audit. What is the in-progress block? These are courses that you are registered for but have not yet completed or received grades. What is the courses not used toward current program block? This block contains courses that are not being used to fulfill graduation requirements for this program. What is the grade requirements not met block? It is a list of courses that do not meet minimum grade requirements for your program. Can I get an official transcript of my grades through myPath? No. myPath is an unofficial record of your academic history. A transcript is an official and complete document of your academic history. Transcripts are ordered online by logging into myAccount. Once you are logged in, go to the "Student Records" menu and choose "Request Official Transcript." Go to our Transcripts page for more information. I get an error message/blank screen when I try to access myPath. What should I do? NOTE: myPath displays on Internet Explorer and Mozilla Firefox and Google Chrome. My question isn't covered here. What can I do? Watch the videos above on the right side bar. If you still have questions, contact the Help Desk at 604 527 5330. How does the audit decide where to place courses that I have completed? The audit places each course using a “best fit” scenario and some courses can fit into multiple categories, such as Arts elective and Humanities elective. The “best fit” process will not always be perfect, particularly when multiple possibilities exist and course allocation could change every time a new audit is run. Why does my Associate Degree specialization not appear in my audit? To see how your courses meet specialization requirements, please run a "what if" audit and select your area of specialization from the drop-down menu option. I have been cleared for graduation, but myPath says that I haven’t completed all my requirements. Does this mean that I won’t be able to graduate? Not necessarily. This can be a timing issue such as posting of grades for the current term. If you have followed through on any requirements you were told to complete, you should still be on track for graduation. Contact an academic advisor as soon as possible. My transfer credit and Douglas credit for the same course are used on my audit. Is this correct? Transfer credits will appear with an "!" Mark next to them. If you have taken a course at another institution and the equivalent course at Douglas, that course may appear in your audit more than once. You may only use an equivalent course once towards any requirement for your program. I have already received a credential from Douglas. Am I eligible for another one? Credits earned for one credential may be used to meet some or all of the requirements of a second credential as per the Credentials Awarded Policy. For more information, visit our Credentials Awarded Policy page or contact an Academic Advisor or our Graduation Office.